Image Size: 25" x 12.5"
Overall Size: 31" x 19"
During the summer of 2005, over six hundred paratroopers were brought together to forge a force that would continue the proud lineage of theirWorldWar II forefathers. On 16 September 2005, the 3d Battalion, 509th Infantry (Airborne) was activated at Fort Richardson, Alaska. The newly formed 3-509th spent twelve months sharpening its spear; its edge was honed on the arctic drop zones of Alaska and baptized in the formidable heat of Louisiana. After one year of training, the 3-509th would deploy to Iraq in support of Operation Iraqi Freedom. In October of 2006, the 3-509th deployed to Iraq and arrived at Forward Operating Base Kalsu. The AO included large population centers, a maze of irrigation canals and MSR Tampa, the largest and most important supply route, linking Kuwait and much of Iraq. Just weeks after getting "boots on ground," the battalion would execute short-notice missions. Charlie Company received orders to deploy to East Baghdad to aide TF1-26. Baker Company headed toWest Baghdad to search for a downed F-16 Pilot. A short three months after arriving in Iraq, the 3-509th found a new beginning in the cities and deserts of the Anbar Province.Multi-National Division Iraq issued orders for the 3-509th to join the ranks of the Marine Expeditionary Force in a decisive effort to regain control of the insurgent controlled outskirts of Fallujah. When TF 3-509 (comprised of HHC, Able, Baker, Blackfoot 1/501, and Fox Company 7/25) arrived to Camp Fallujah, they found Karmah was completely dominated by Al Qaeda cells that controlled the population with terror, snipers, improvised explosive devices, murder, intimidation cells, along with mortar teams and anti aircraft guns. From 28 December 06 to 15 February 07, Al Qaeda attacked TF 3-509 ninety-four times with IEDs, sniper, and indirect fire attacks. In addition, TF 3-509 spoiled an additional thirty-six attacks. On 12 April, the largest attack in Karmah occurred. Al Qaeda mounted a sophisticated attack that simultaneously targeted four of the five OPs in the city and that incorporated an array of weapons systems ranging from small arms to suicide car bombs and indirect fire. The 3-509th's repulsion of the attack was heralded by the residents of Karmah which proved to be a critical victory leading to the increased flow of locals willing to come forward to report extremist atrocities and condemn those oppressing the community and attacking Iraqi and Coalition Forces. On 28 March, TF 3-509 conducted a deliberate attack to seize enemy forces and supplies. A large concentration of leadership and operatives for the Baghdad-Belt branch of the Islamic State of Iraq (AQIZ) were targeted in the raid. The operation resulted in the detention of three of the battalion's top ten high valued targets. TF 3-509 executed dozens of additional intel-driven raids, further eliminating threats and increasing popular support. 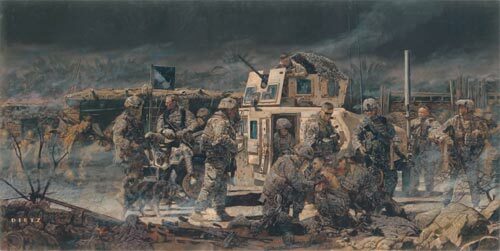 When the last paratrooper from TF 3-509 departed Camp Fallujah for FOB Kalsu on 22 June, AQI cells had been attritted by hundreds and could no longer operate freely in Karmah. The remaining insurgents were forced to move their operations to new safe havens outside of Anbar far from the Geronimo's. While TF 3-509th contributed many successes with the Marines in Anbar, Dog Company and Charlie Company were disrupting the enemy and gaining the support of the Iraqi people in the North Babil Province. Dog Company, 3-509th IN (ABN) was attached to 1-501st PIR from December 2006 until 5 September 2007 and was based out of FOB Iskan. They were responsible for the largest population center in the brigade's AO, the city of Iskandariyah. On 28 April, the company aggressively began targeting both IED cells and indirect fire cells operating out of Buyrat. Simultaneously, the company conducted a series of lethal raids on JAM leaders responsible for mosque attacks. These raids, conducted over three weeks, broke the cycle of insurgent violence. On 23 December 2006, C CO, 3-509 became attached to 2-377 PFAR, assuming the bulk of 3-509th's former area of responsibility. Charlie Company's method of operation included intensive intelligence gathering and gaining the trust of the locals. Using these to its advantage, Charlie then sought out and destroyed the leadership of AQI cells. Charlie Company severely disrupted AQI, and AO Charlie was no longer a sanctuary for insurgents. This contributed to the successful capture and destruction of over sixty-eight terrorists and twelve senior leaders of AQI cells responsible for IED attacks, IDF attacks, kidnappings, and VBIEDs. TF 3-509 returned from the Al Anbar province on 23 June 2007 and assumed its role as the 3rd Infantry Division main effort during Operation Marne Avalanche. During Marne Avalanche, the 3-509th IN (ABN) conducted two battalion level air assault missions and fifteen company level air assaults throughout the MND-C area of operations. These air assaults resulted in numerous detainees and served to disrupt the operations and support of Sunni and Shia extremists throughout the Division AO. Following the completion of Marne Avalanche, in September 2007, the 3-509th IN (ABN) took control of AO Naples while Blackfoot Company returned to 1-501st and Dog Company returned to 3-509th. During this time period, the battalion worked closely with local sheiks, tribal leaders, Iraqi Police, and Iraqi Security Forces to foster reconciliation between Shias and Sunnis. The establishment of numerous Concerned Citizens Programs (CCPs) throughout AO Naples resulted in local Iraqi citizens taking a positive and active role in providing for their own security while under the supervision of Coalition Forces. Upon redeployment to Fort Richardson, Alaska, the 3-509th IN (ABN) had significantly disrupted AQIZ in the Euphrates River Valley and set the stage for the rapid spread of Sunni Concerned Citizens in the Euphrates River Valley and east into the rest of AO SPARTA. The 3-509th operations in AO Naples drastically disrupted extremist JAM operations and AQIZ was nearly defeated. The Geronimos returned home with their heads held high knowing that they had honored the sacrifice and proud tradition of those paratroopers who had come before.